In this verse, God has given us the Holy Spirit as our role model for how prophecy is supposed to be carried out. And should it not be that way? The Spirit is our teacher (John 14:26). Furthermore, Jesus followed this same model while on earth. He said, “He Who sent Me is true, and I speak to the world those things which I have heard of Him” and, “I do nothing of Myself; but as My Father has taught me, I speak these things” (John 8: 26, 28). A true prophet parallels the Holy Spirit (and Jesus) by not speaking on his own initiative. He speaks only what he hears from the Lord. This is what is meant by “speaking as the oracles of God“ (1 Peter 4:11). The prophet does not get ahead of God or speak presumptuously. He does not speak what he thinks is right, and then expect God to back him up. He waits to hear God first, and then he speaks. Unfortunately, some modern-day prophets are not following the model given to us in John 16:13. A popular teaching in prophetic circles says we can “step into” prophecy at will: merely decide to prophesy and just start speaking in faith. God then supposedly backs up the prophet by filling his mouth with the word of the Lord. As a result, we are seeing far too much presumptuous prophecy coming from natural understanding or wishful thinking. Inner anxieties, faulty theological mindsets, and a desire for personal recognition can also contribute to inaccurate prophecy. In the next verse, John 16:14, Jesus adds this about the Holy Spirit: “He shall glorify Me, for He shall receive what is Mine, and shall show it to you.” Continuing with the Spirit as our model, any true prophetic revelation must in some way glorify Jesus. If a word or vision is genuine, it will always point back to Jesus, for He is the absolute Center of all. He never gives His glory to another (Isaiah 42:8). The word might not speak of Jesus directly, but it will ultimately cause us to turn our hearts to Him in greater reverence. I have majored on just part of what John 16:13 has for us. It also promises that the Holy Spirit, the Spirit of truth, will guide us into all truth. I had been pondering this verse in response to a prophetic word I had come across. Some of the things said by the prophet troubled me, and I used this verse as my prayer to know the truth: Spirit of truth, please guide me into all truth. Is this prophet speaking rightly or not? I want to align myself with You. By the end of the day, I had my answer. The Holy Spirit enlightened me with His perspective by recalling to mind some Scriptures which refuted what was being claimed by the prophet. John 16:13 also promises, “He will show you things to come.” The Lord is eager to share with His people what is yet ahead, so that we are not blindsided. He doesn’t tell us everything, but a good many times He desires to give us glimpses into the future, if we are willing to listen. Such a rich verse! The Word of God brings life and strength to us. I will not be the same, since seeing these things. I hope sharing what I have learned will be a blessing to you, too. Making a regular practice of meditating on God’s Word was not always a part of my devotional life. For many years, I consistently read the Bible, and I learned a great deal that way. Sometimes, when I was intrigued by a particular verse, I did a little study — looking it up in other translations, perhaps checking out the meanings of a few words in Strong’s Concordance, and investigating what commentaries had to say about it. But meditate on it? Not so much. Why? Because I didn’t know how. It was one of those things nobody ever taught me. Then, a couple of books came my way, which helped me to see that I was missing a very important component of how God wants to interact with us through the Bible. I like to make things as simple as possible, both for myself and others, so what I share today won’t be as detailed as their methods, but if you would like to go deeper, I highly recommend both books. So, how do I personally meditate on God’s Word? I ask God to give me a verse or passage. Once I’ve asked, I may hear from the Lord right away, or I might need to keep asking Him for a day or two. He then brings a verse or phrase from Scripture to mind. If I don’t know where it is in the Bible, I locate it in a concordance or by searching for it in Google. Or, in my regular course of reading, a verse just comes alive to me. Either way, I know that this is the verse or passage God wants me to meditate on. I write out the verse in a notebook I keep just for Bible meditation purposes. I read it aloud several times, and think about it. As I do that, a phrase from that verse may seem to be particularly meaningful, so I focus on that part. I ask God if He would like to bring a picture (which is a mini-vision) to mind which goes along with the verse or phrase, and then I wait for His response. If I receive a picture, I either try to draw it or describe it in my notebook. If God is not already flooding me with thoughts about the verse (usually He is), I ask Him to speak to me about it. I write down whatever He says or whatever insights He gives. At this point, I frequently start to remember other Bible verses which go along with my meditation verse. I write those down, too, and I explain in my notebook how they fit with the verse I started with. I ask God to show me how to apply the verse to my life. I thank Him for what He is revealing to me. I may pray the verse back to Him, if that seems to fit. I try to remember the verse throughout the day. As I do that, God may give me additional insight. If He does, I return to my notebook and write it down. I go back to the verse the next day and think about it again, to see if the Lord has additional revelation for me in it. I sometimes repackage what I have learned by restating it in a Facebook and/or Twitter post. That solidifies it for me, but it also inspires and blesses other people. Twelve steps might seem like a lot, but they are only general guidelines. You don’t have to check them off point by point. I do this very informally, and all the steps may not happen each time. The important thing is to commune with God over short pieces of Scripture so that you are thinking about Him more and growing in knowing Him better. The amount of time I spend on a particular verse or passage varies. It may be one day, a week, or for longer passages, several months. I sense in my spirit when the mission has been fully accomplished. Sometimes I come back to it again many months later. I do not meditate on a single verse in place of reading the Bible in larger chunks. Consuming bigger portions of the Word daily is also important. I usually incorporate Scripture meditation into my morning prayer time, while reading at length in the evening works well for me. Everyone is different, so use whatever method is best for you. Do you have additional suggestions you would like to share? Please comment! The Intercessor’s Companion Audio Book Is Here! The audio book version is a super way to encourage yourself and to build your faith as you press through to receive your answers. In the process of spending many hours recording and editing this 3-CD set, I personally felt like I had entered a higher realm spiritually — because “faith comes by hearing, and hearing by the word of God” (Romans 10:17). It’s true, friends! There is power in the spoken Word of God. Those of you who already own The Intercessor’s Companion in e-book or print form will enjoy using the audio book as a complementary tool to the written book. And those of you who don’t yet have the written version? You can use the audio book all by itself — but you may find you like it so well that you’ll be eager to have it in written form as well! Are Character Building Studies Necessary? Nearly twenty years ago, I published my first book, Character Building for Families, Volume 1. I had originally written the materials for our family, simply because, at the time, no one else was writing such things, and we had a need that was not being met. By the time we made my book available for the world, two other homeschool families had also come up with similar ideas. We were pioneers, I guess. Now, there are hundreds of character education books to choose from — for both children and adults, from both secular and Christian viewpoints. Why is teaching character with a book important? Won’t it just sink in naturally? You know, we teach by example more than by our words, don’t we? Well yes, and no. Being a great example is important. Speaking the right words, while not following through by living the way we speak, is not generally very productive. But teaching by example alone can be rather hit-or-miss. We’re not going to have opportunity to thoroughly model everything our kids (or adult believers we are discipling) need to know about integrity, based on isolated incidents that arise naturally. Personally, I think it is important not only to show people how, but also to give them a “why” which is founded in the Word of God. Seeing a concept clearly laid out in the Bible, and taking the time to study that concept together, anchors its truth in our hearts. And, if we build a foundation one block at a time, “line upon line, precept upon precept,” the results are going to be more solid. Isn’t character education just bringing about behavior modification? I’ve heard this criticism a few times, and my answer is, “Not if it is done right.” The goal should always be heart-change. Our aim should be for our children (or adult Christians we serve) to desire good character because they want to be like Jesus, not just so that they can avoid unpleasant consequences, impress other people, or be successful. Outward change without inward transformation is hypocritical, and it can rarely be upheld for any length of time. Somewhere along the way, the real person will leak out! That is why, in our own character education materials, we focus on applying the presented concepts to the heart. We tell people using our Character Building for Families manuals that the parents are going to have their character built right along with their children — and we’ve had quite a few parents write to us, testifying to the truth of that statement! Tragically, the Church has often fallen into the mistake of telling our young people that if they will just “be good,” God will love them and take them to heaven. That is behavior modification and a false gospel message. True character education brings to the student an understanding of Who God is and how we should become like Him, coupled with the knowledge that we can only accomplish this through asking God to do it in us by the power of the Holy Spirit. Our goal should be to raise up disciples who have a passion for the Lord Jesus, not to merely make them valuable community citizens. The outward good behavior will naturally come, as we address and repair the issues of the heart. Will character training solve our home problems (or our church’s problems)? I’m sorry I can’t promise you that. It would be nice if it did, wouldn’t it? My children did not become perfect by repeatedly studying our character materials. Neither did I. But we made some progress together. The Character Building for Families lady still messes up sometimes. Every one of us is in a lifelong process of growing into the image of Christ. We learn to be kind, and somewhere down the road, God will take us into deeper levels of learning to be kind. Step #1 is to equip ourselves with the recognition of where the old, selfish nature is still at work in us and the knowledge of how to overcome it, but the walking-out process is challenging and ongoing. Character studies are a tool, but we must wield the tool we’ve been given. Are you still interested in stepping into the journey? 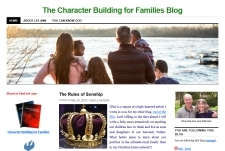 Please visit us at our Character Building for Families website. In addition to our books, we’ve got many free Christian and homeschooling helps there to serve you. Sometimes we do the best that we can, seeking to walk in integrity and humility of heart, trying our utmost to stay conformed to the likeness of Jesus, and yet something goes wrong. Another believer chooses to see our motives as evil when they are not, begins to go on the attack, brings up a nasty report against us, and, unfortunately, the criticism is believed by those who ought to know us better than that. In the time when I am afraid, I will trust in You. In God I will praise His Word; in God I have put my trust. I will not fear what flesh can do unto me. In God I have put my trust: I will not be afraid what man can do unto me. No weapon that is formed against you shall prosper, and every tongue that shall rise against you in judgment you shall condemn. This is the heritage of the servants of the LORD, and their righteousness is of Me, says the LORD. Commit your way unto the LORD; trust also in Him, and He shall bring it to pass. And He shall bring forth your righteousness as the light, and your judgment as the noonday. I called upon the LORD in distress; the LORD answered me, and set me in a large place. The LORD is on my side; I will not fear. What can man do unto me? The LORD takes my part with those who help me …. Remember that God sees it all, and He knows how to deal with it. He will either eventually set the record straight, or else bring you into greater humility and Christ-likeness through the experience. Although it is never easy to endure being treated unjustly, if we will refrain from lashing back and will continue to keep our hand in His, over time, our real character will be revealed to all. For this is the will of God, that with well-doing you may put to silence the ignorance of foolish men. [For Jesus Himself] when He was reviled, did not revile in return. When He suffered, He did not threaten, but committed Himself to Him [the Father] Who judges righteously. Finally, be all of one mind, having compassion one of another. Love as brethren. Be pitiful and courteous, not repaying evil for evil, or railing for railing, but on the contrary, blessing — knowing that you are called thereunto, so that you will inherit a blessing. This was the first time the Church received what we commonly call “the baptism in the Spirit.” The Greek word for baptize means to fully cover, or to make fully wet. The early Church understood baptism to mean a full immersion, including how they conducted water baptism. The Baptism in the Spirit, therefore, is to be fully immersed in the Spirit, and this is what the believers in the upper room experienced. The entire room was filled with the Spirit, and they were also filled on the inside with the Spirit. The evidence of the Presence of the Spirit externally around them was the manifestation of the sound of wind and the tongues of fire, while the evidence of them being filled internally was that they spoke in tongues. While the wind and the tongues of fire are not mentioned again in succeeding stories of believers being baptized in the Spirit, the evidence of tongues is. When Peter preached to the Gentiles in Cornelius’ house, “the Holy Spirit fell on all them who heard the word. And they of the circumcision [the Jewish believers] … were astonished … because the gift of the Holy Spirit was poured out also on the Gentiles, for they heard them speak with tongues and magnify God …” (Acts 10:44-46). There were believers in Ephesus who had not yet been baptized in the Spirit. When the Apostle Paul “laid his hands upon them, the Holy Spirit came on them, and they spoke with tongues, and prophesied” (Acts 19:6). That there was an outward evidence of receiving the baptism in the Spirit is also implied in Acts 8:14-19, the story of the converts in Samaria. This evidence most likely was speaking in tongues as well. Whatever it was was an unmistakable outward sign. Is the baptism in the Spirit for all believers, or only for a select group? Peter gives us the answer to this question in Acts 2:38, 39: “… Repent and be baptized [this is water baptism] every one of you in the name of Jesus Christ for the remission of sins, and you shall receive the gift of the Holy Spirit. For the promise is to you, and to your children, and to all who are afar off, even as many as the Lord our God shall call.” The promise was to all those who were listening to Peter on the day of Pentecost, and to their succeeding generations, and to all who were afar off — in generations to come and in far-flung places where the gospel had not as yet been preached. The Christians of the early Church considered it abnormal for a believer to not be baptized in the Spirit, and they took steps to rectify such situations. When Philip preached at Samaria, the new believers there were not yet filled with the Spirit, so the apostles sent Peter and John to help them receive (Acts 8:14-16). Paul noticed that there was something wrong with a few of the believers at Ephesus and laid hands on them so that they would receive the Spirit (Acts 19:2-6). 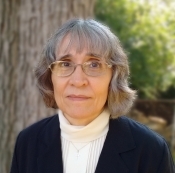 It is possible, although we cannot know for sure, that when Aquila and Priscilla noticed that something was not quite right in Apollos’ preaching, that the baptism in the Spirit was the missing ingredient. They then helped Apollos know “the way of God more perfectly.” (Acts 18:24-26). Next time, we will answer a few more common questions about the baptism in the Spirit, and after that, we will get to how you can easily and confidently receive the baptism in the Spirit with the evidence of speaking in tongues. In a soon-coming post, I will explain how to easily receive the baptism in the Spirit with the evidence of speaking in tongues. Many of my readers have struggled to receive the baptism, and their prayer language along with it, and have become frustrated and even despairing of ever receiving. This is due to much wrong traditional teaching, which has hindered the Body of Christ from receiving what the Lord has always meant for every believer. We’re going to clear that up, and help you receive once and for all — even if you have been prayed for dozens of times in the past and have been disappointed. In preparation for that, I would like to lay the foundation of what the baptism in the Spirit is. John the Baptist said of Jesus, “I indeed baptize you with water; but one mightier than I is coming … he shall baptize you with the Holy Spirit and with fire” (Luke 3:16). Every believer in Jesus Christ has the Holy Spirit dwelling within. Romans 8:9 tells us, “But you are not in the flesh, but in the Spirit, if the Spirit of God dwells in you. Now, if any man does not have the Spirit of Christ, he is not one of his.” Jesus promised His disciples right before His death, “And I will ask the Father, and he shall give you another Comforter, that he may abide with you forever, even the Spirit of truth; whom the world cannot receive, because it does not see him, neither does it know him. But you know him, for he dwells with you, and shall be in you” (John 14:16, 17). He goes on to say that it is by the Spirit living within believers that He and the Father will abide with them (John 14:18, 23). When we tell little children to “ask Jesus into your heart,” what we are really saying is, “Believe on Jesus and yield yourself to Him, and when you do, the Holy Spirit will come to live inside.” It is through the Spirit that the Father and Jesus also reside with us. It is because the three Persons of the Trinity are one God. When Jesus first appeared to the eleven on the day of His resurrection, He commissioned them and gave them authority to carry on His work, “and when he had said this, he breathed on them, and said to them, ‘Receive the Holy Spirit'” (John 20:21, 22). Was this the baptism in the Spirit? Clearly it was not, since Luke tells us in Acts 1:3 that Jesus continued appearing to the apostles for yet another forty days, instructing them about the Kingdom of God, which they were to cooperate with Him in establishing on the earth, and during that forty days, “being assembled together with them, [he] commanded them that they should not depart from Jerusalem, but wait for the promise of the Father, ‘Which,’ he said, ‘you have heard of me. For John truly baptized with water, but you shall be baptized with the Holy Spirit not many days from now'” (Acts 1:4, 5). He also told them, “You shall receive power, after the Holy Spirit is come upon you, and you shall be my witnesses …” (Acts 1:8). Although the disciples were already believers, having received the Holy Spirit, there was yet a further infilling that God wanted them to have, which would give them power to witness effectively for Him in a way that they could not otherwise do. We will look at what that further infilling was next time.